After the hoopla of fall travel and the winter holidays, Dave and I decided we would not travel at all until the summer. 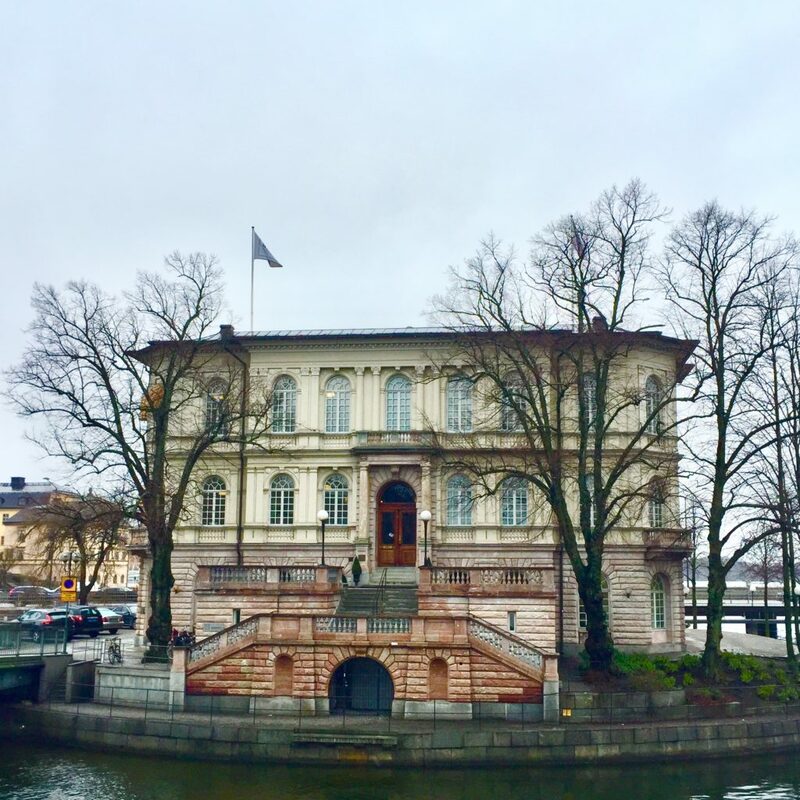 But you know what they say about the best-laid plans—last week, we visited Stockholm, and this is how it went down. 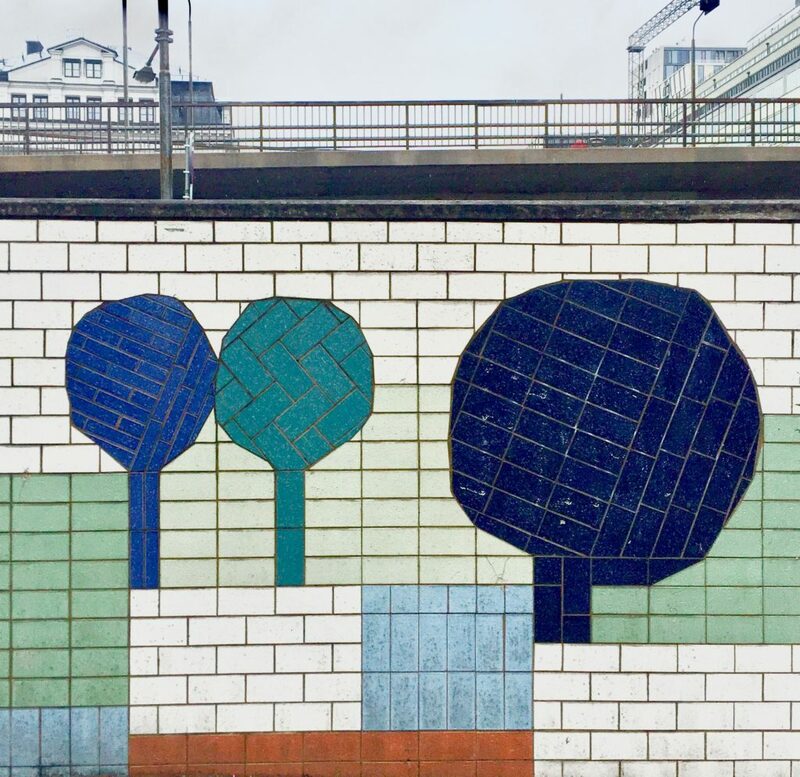 As all good adventures do, it started on the bus to the airport—followed by a 2-hour flight and a bus ride into Stockholm. 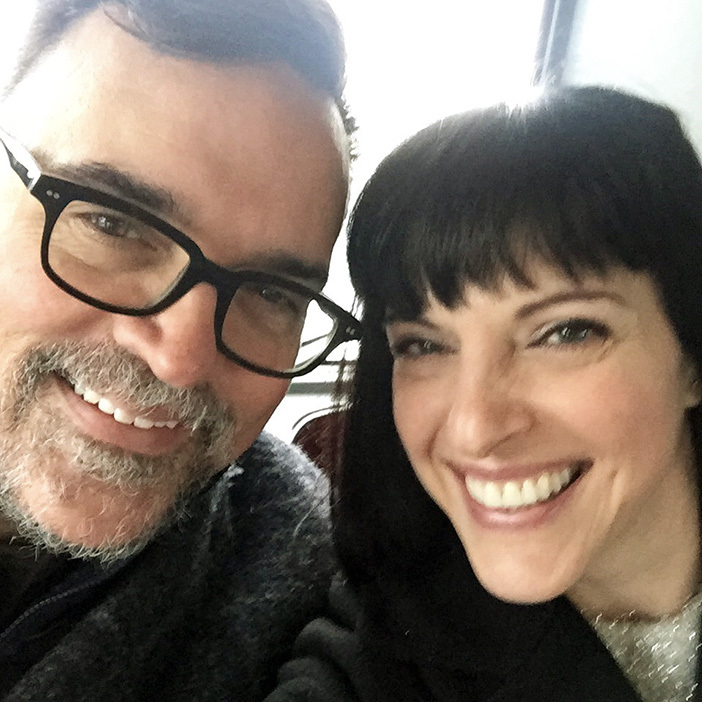 I always make Dave take a bus selfie at the start of a trip. Dinner our first night in town was at Meatballs for the People. I wish the service staff had been a bit more welcoming and friendly, but all was forgiven when the plates arrived. 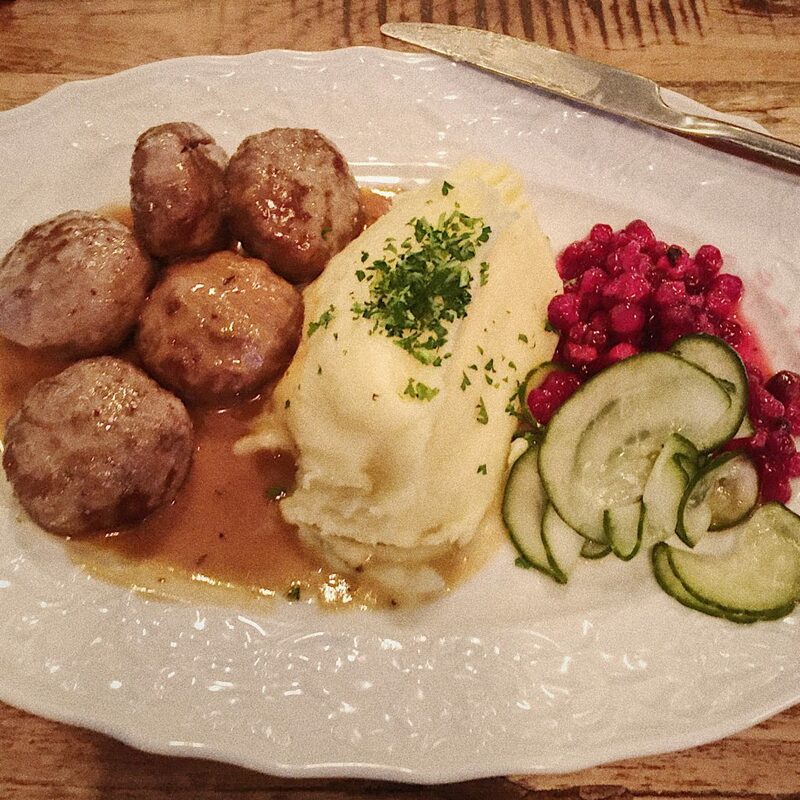 The meatballs were so tender and the perfect bite of meatball+potatoes+lingonberries+pickles was… well, perfect. The sun the next day was brilliant, and the air was crisp and cold. It’s difficult to see in this photo, but the harbor was filled with enormous chunks of floating ice. 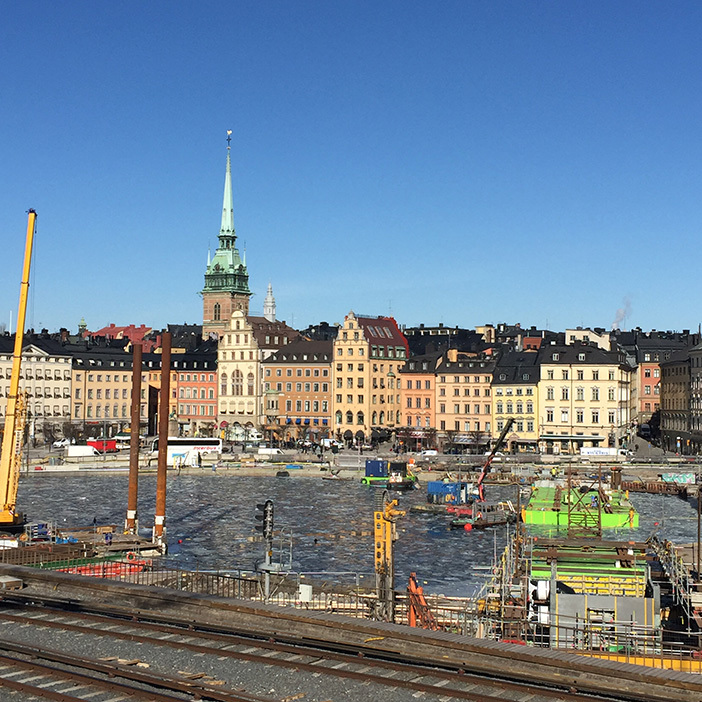 We stayed in Gamla Stan (the Old Town), and the part of the harbor connecting us to the next island over was under construction. I love the juxtaposition of nature and the cranes. 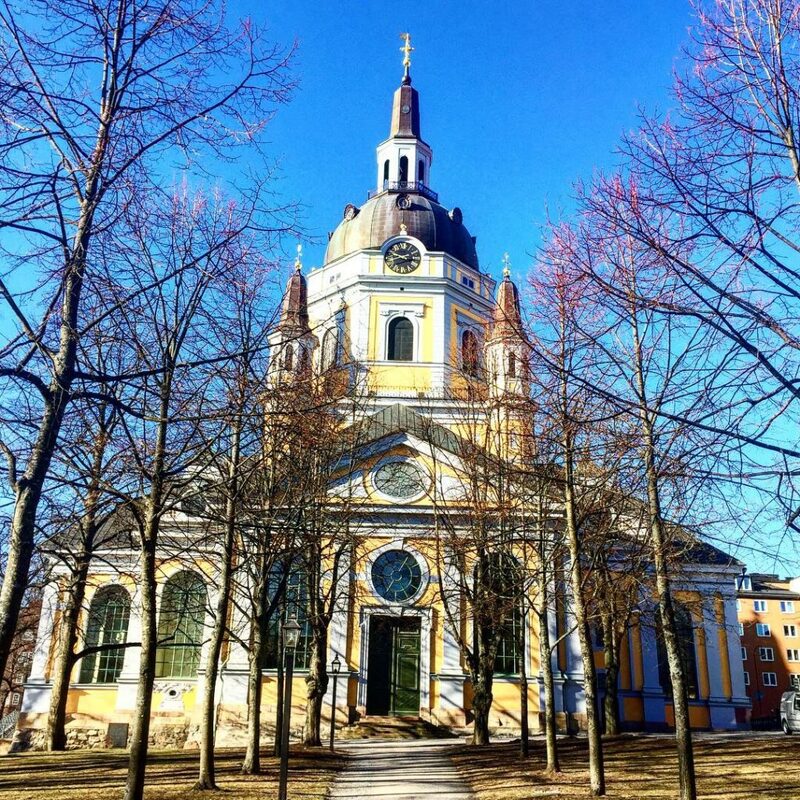 This is the Katarina Kyrka (church), originally constructed in the mid-1600s. We passed it many times on our walking excursions. 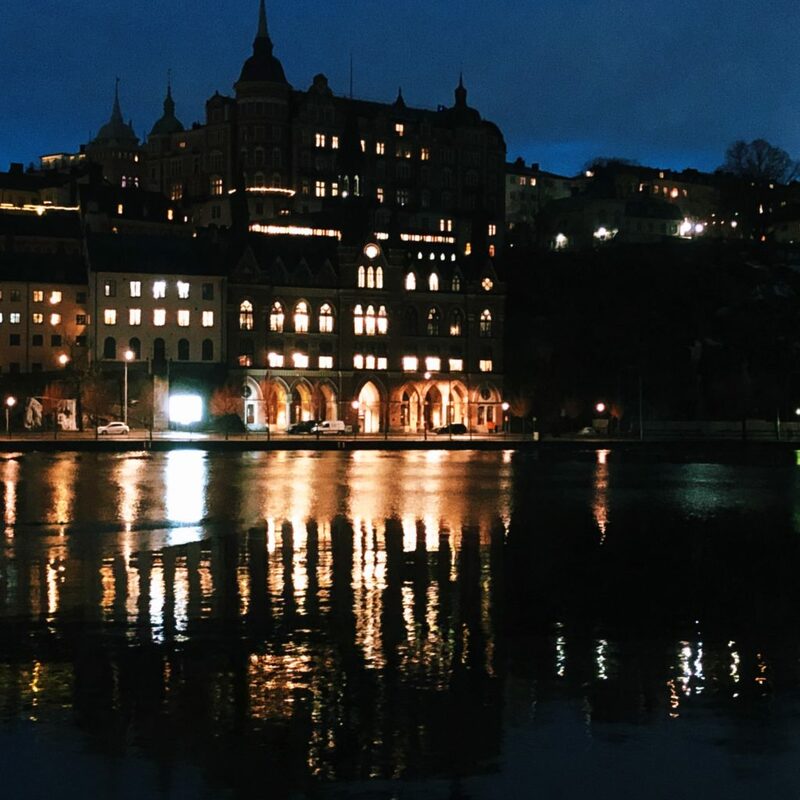 It’s worth mentioning that Stockholm is a stunner at night, too. Confession: When we travel, we often find a breakfast spot we love, then eat there every morning. Our preferred café to start each day in Stockholm was The Greasy Spoon. 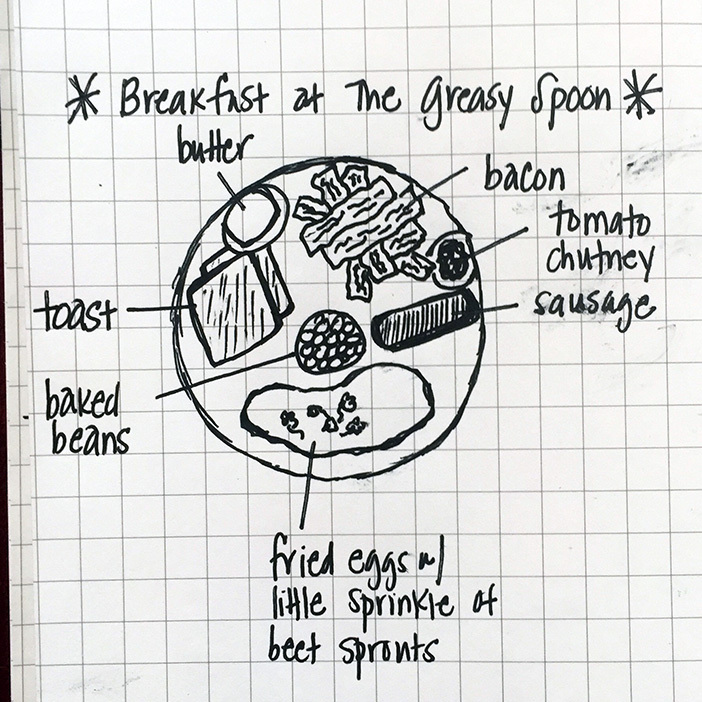 I do not have a photo of my English breakfast, but here’s the sketch from my travel journal. We were thrilled that the English breakfast included a hefty pile of American-style bacon, a true rarity here in Europe. I’m a sucker for an offbeat museum, and we spent an entire day at the wonderful Vasa Museum. 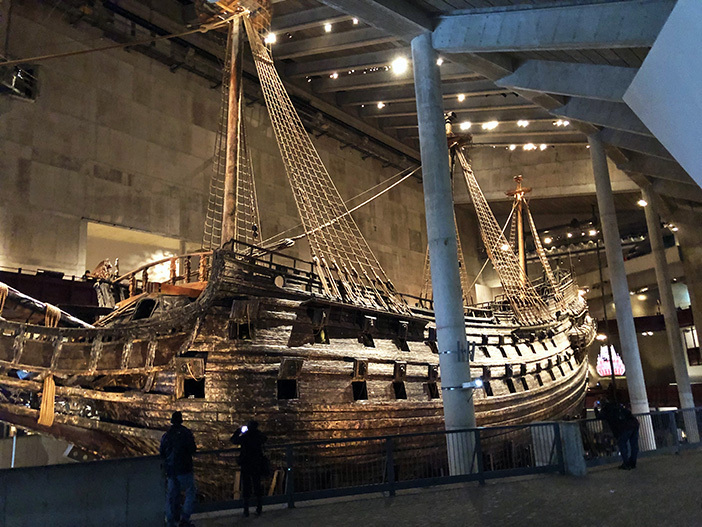 It was custom-built around a 17th century warship that was salvaged from the bottom of the harbor in 1961, after spending 333 years under the Baltic Sea. The doomed ship set out on its maiden voyage on August 10, 1628. It was tall and narrow and top-heavy, without enough ballast in the hull. About 1400 yards into its journey—approximately 45 minutes—with thousands of people standing on the shore, cheering, it was struck by a gust of wind and immediately sank to the bottom of the sea. The restored ship is 98% original, and the seven-story museum is packed with stories about daily life aboard ship in the 1600s. There are computer re-creations of peoples’ faces based salvaged skulls, tender displays of recovered skeletons, fascinating details about the raising and restoration of the ship, weapons and boardgames and kitchenware, and the gorgeous ship itself. It’s impossible to understand from photos how enormous and beautiful this ship is in person; it was quite emotional. Pro tip: The café at the museum has delicious, vibrant homemade food and breathtaking views of the harbor. I had a two salads: shrimp-and-hard-boiled-egg alongside a crisp green salad with smoked mackerel. Dave enjoyed another round of meatballs and lingonberries. Highly recommended. 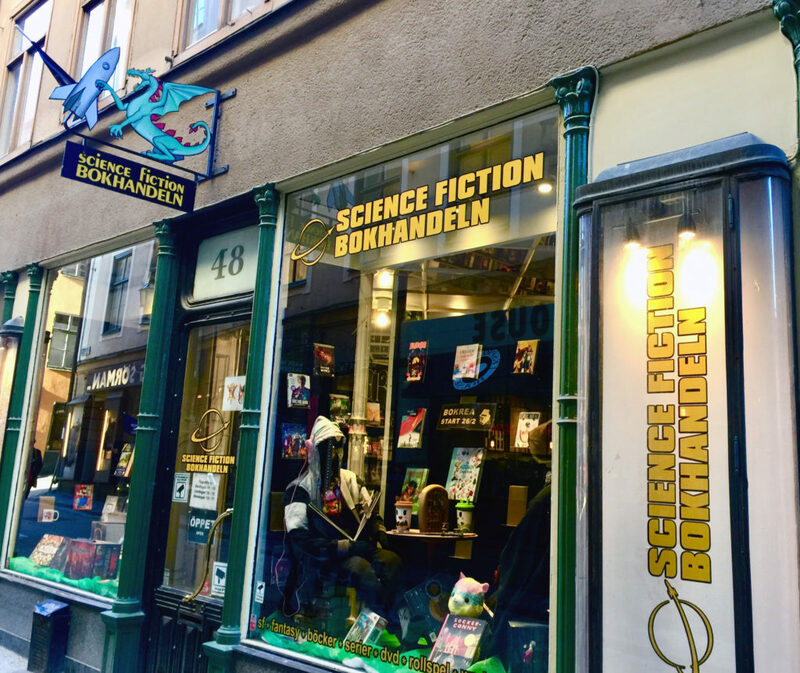 We also visited two bookshops—the English Bookshop and the Sci-Fi Bookshops—that convinced me to buy books that I absolutely, 100% did not need, but also totally needed. Both shops offer vast collections of English-language books that are clearly curated by someone with excellent taste. I wanted everything I set my hands on! Since we moved to Prague, I’ve been reading almost exclusively on my Kindle because it’s so much easier to get English-language books that way. 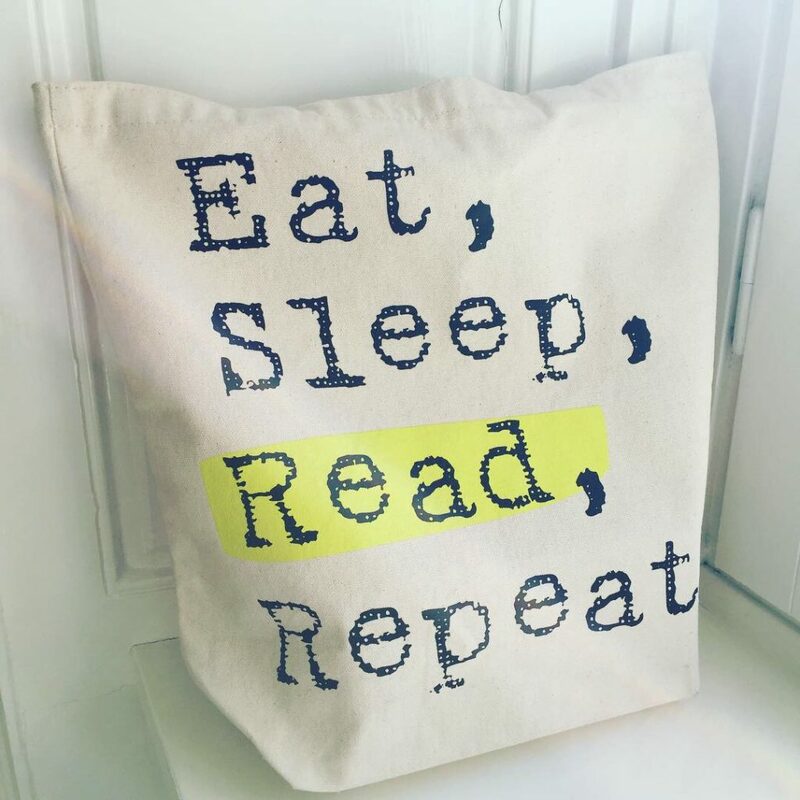 But whenever we visit physical bookshops, we indulge in some lovely print books. 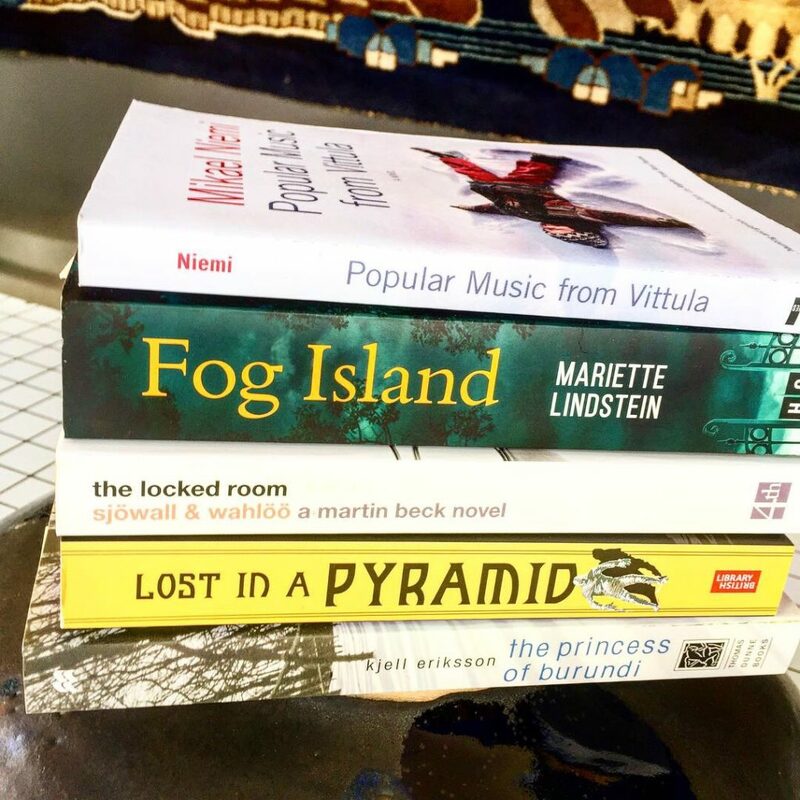 This is our haul from the English Bookshop: Popular Music from Vittula (literature), Fog Island (thriller), The Locked Room (police procedural), The Princess of Burundi (murder mystery), and Lost in a Pyramid (short stories from the golden age of mummy tales). 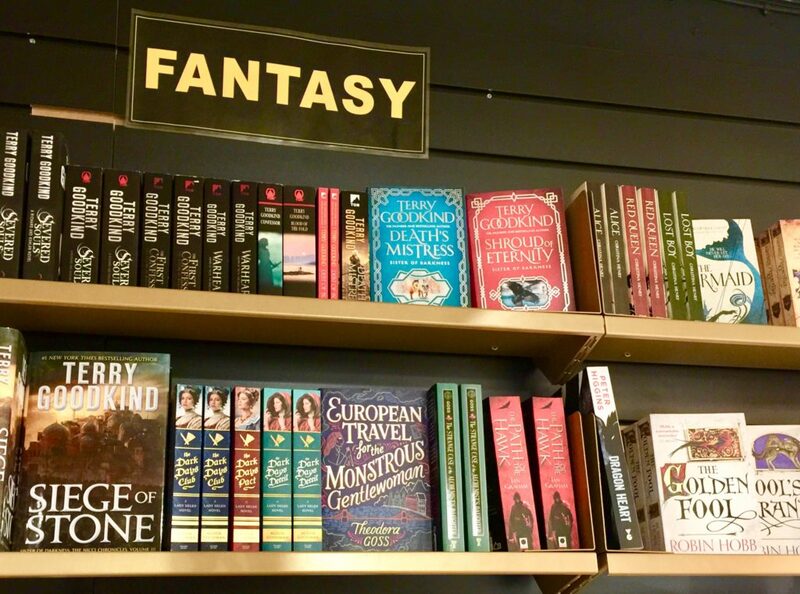 All of these books are set in Sweden, except for the mummy stories. 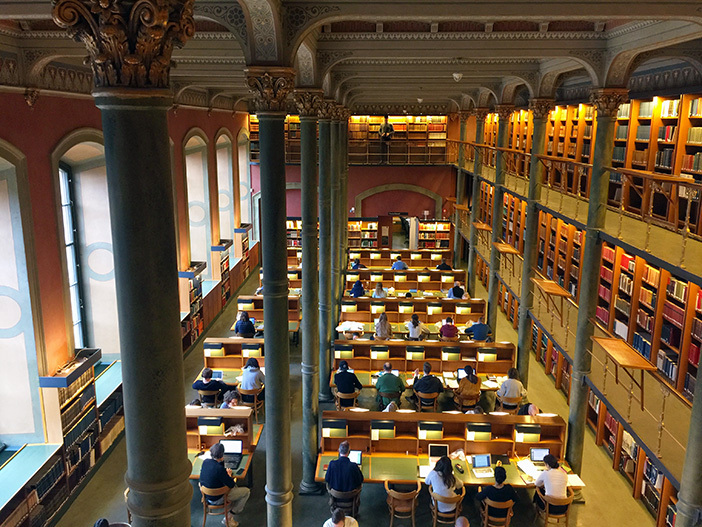 The highlight of our trip for me was our visit to the National Library of Sweden. It has a beautiful reading room that anyone is welcome to use for reading, studying, computer work, or daydreaming. It was so quiet, I felt compelled to run up and down the aisles, yelling, “La la la!”—but I did not. 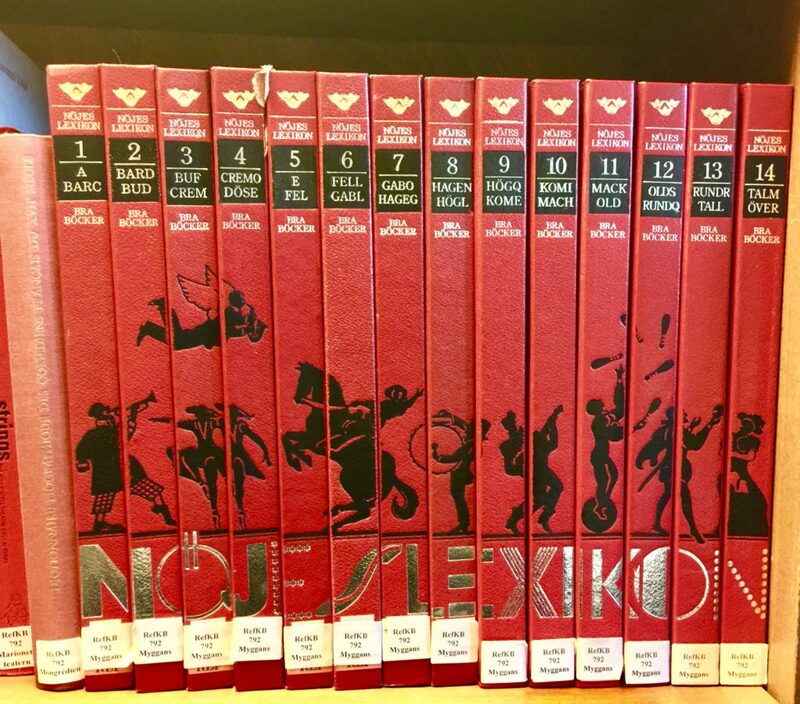 I found this encyclopedia of entertainment on the shelves of the reading room. It was packed with photos of Swedish and American movie stars from the early decades of the 20th century. There’s also an airy café that serves excellent rooibus tea and coffee—and somehow achieves the exact right level of people-murmur. We worked for a few hours before exploring the library, and it was a very pleasant environment for getting stuff done. But the best part of the National Library is the one-of-a-kind Codex Gigas, a.k.a., the Devil’s Bible. It was created in the early 13th century, and experts now believe it was written by one monk. It’s about three feet tall and weighs a staggering 165 pounds. It’s bound in white leather with fancy gewgaws on the outside. Inside, there’s a complete text of the Bible in Latin, along with incantations, exorcism spells, a calendar, and Hebrew, Greek, and Slavic alphabets. In the middle of the illuminated text, there’s a drawing of the kingdom of Heaven with a full-color illustration of the devil on the facing page. 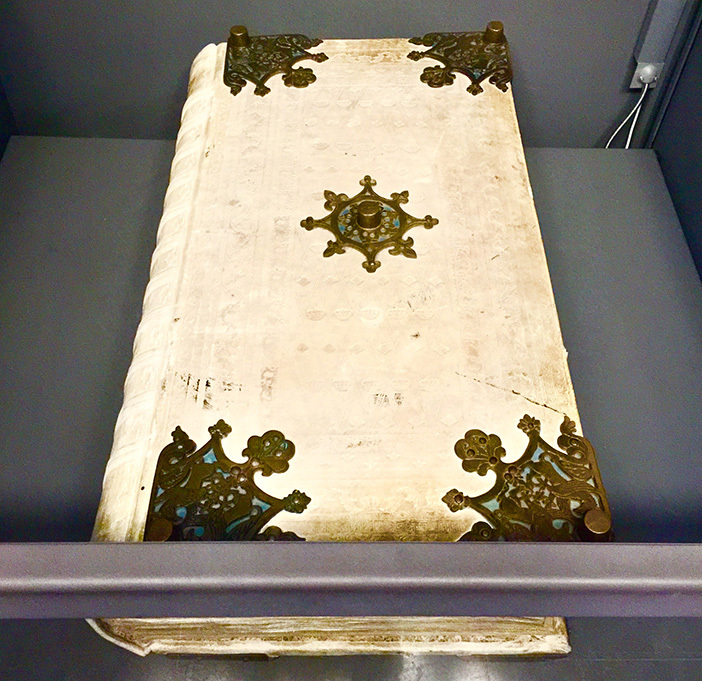 To protect the book from the damages of air and light, it’s kept in a case, which makes it very difficult to take good photos—but here’s my terrible photo so you can see the magnificence of this monster book. According to legend, a monk who broke his vows was sentenced to be walled up alive (!). He begged for clemency and promised to write—in one night—a book that included all human knowledge. At midnight, he realized he would never succeed in his task, so he prayed to the fallen angel Lucifer to help him. The devil delivered, and the monk drew the devil’s picture in gratitude. According to this documentary from National Geographic, in reality, one monk wrote the book over the course of approximately 25 to 30 years. It was originally kept at a monastery in Bohemia (a.k.a., Prague), but was stolen by the Swedes during the 30 Years War and taken to Stockholm. 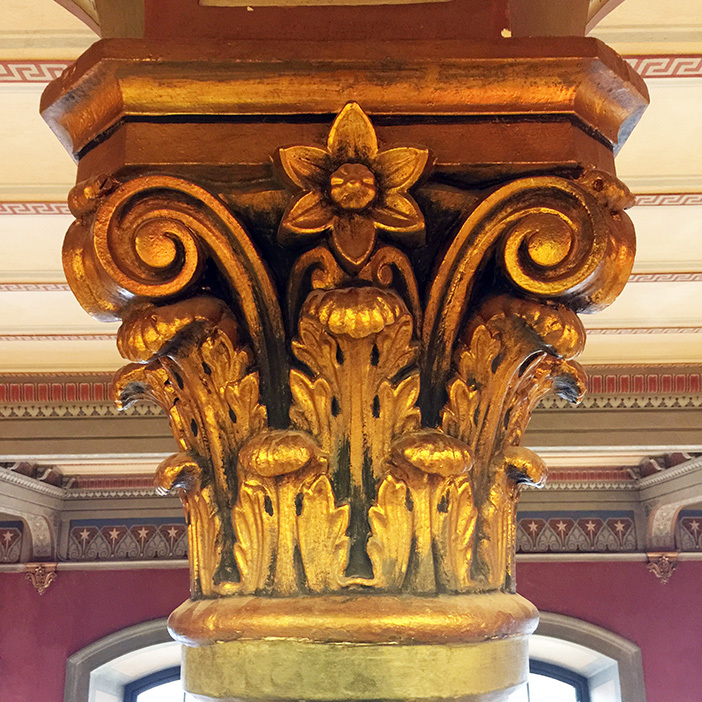 It is amazing to me that you can just walk into the National Library of Sweden, take the stairs to the second floor, and see this treasure with your own eyes. There’s a delightful video presentation in the display room—in Swedish with English subtitles—and an excellent touch-screen display that allows you to page through the book. I would be remiss if I didn’t mention fika, the Swedish version of a coffee-and-chat break that usually includes coffee and a cinnamon or cardamom bun. 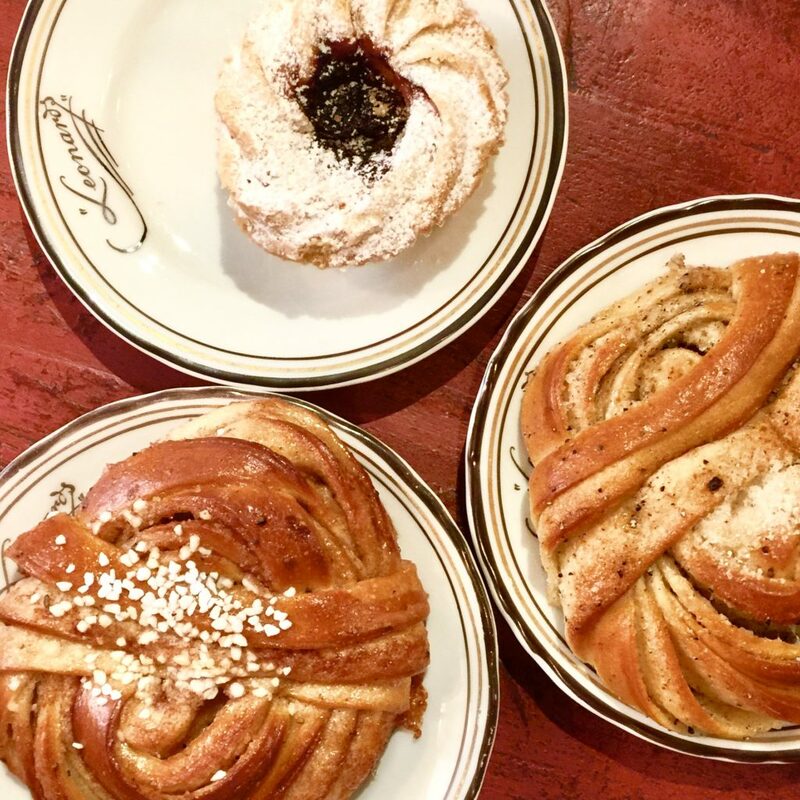 We indulged at a wonderful bakery in Gamla Stan called Fabrique, where we tried hallongrotta (literally, raspberry cave), a sort of butter-cookie crust with raspberry jam; a cardamom bun (on the right); and a cinnamon bun (the one with the coarse sugar on top). The buns were crisp on the outside, chewy in the middle, and not too sweet. 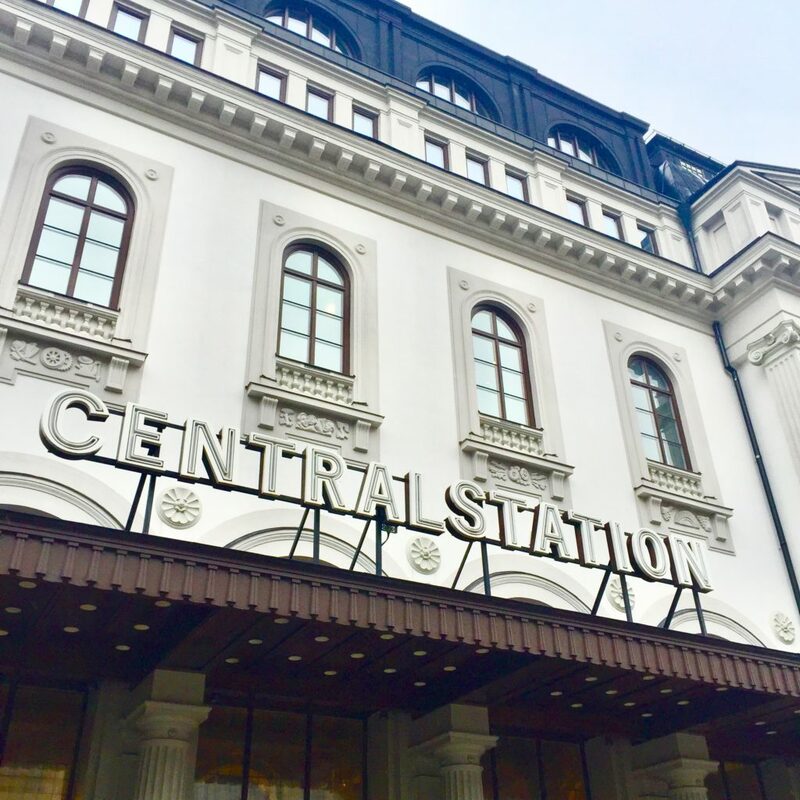 Now seems like a good time to mention that, although you don’t see it in these photos, there is plenty of paleo-friendly food in Stockholm, including Thai curries, salmon, shrimp, and gorgeous salads. On our last day, the weather was rainy and gray and pretty unpleasant, but we passed some cool scenery on our walk to the train station. 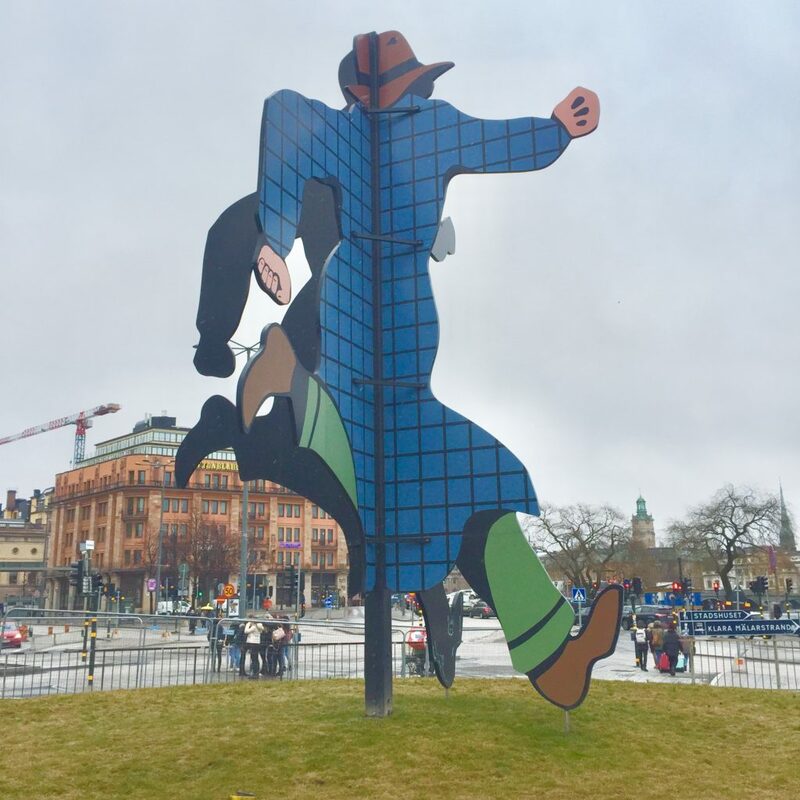 This sculpture is called “Vem är Mr Walker?” (Who is Mr. Walker? ), and it was created by Swedish artist Jan Håfström. Inspired by The Phantom comic strip, it shows Mr. Walker, the Phantom’s alter ego, running toward the city. 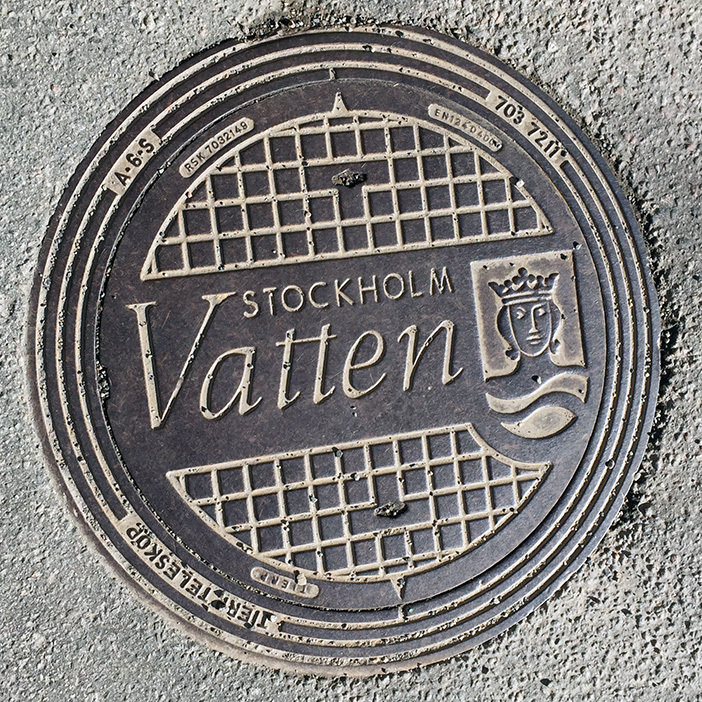 It’s in Järnvägsparken (Railroad Park), right next to the Central Station. This is where our Swedish adventures came to an end… for now. Stockholm was bracing and beautiful and very easy to get around, thanks to the ubiquitousness of English. It’s cosmopolitan and quite sprawling, but each island feels like a small town, and the café scene is top notch. What an awesome adventure. I have to admit I was really happy to read this as I have been worrying about you lately, it just felt like a little of your usual spark was missing and we weren’t hearing about as many adventures , which made me wonder if you were having health struggles. I don’t mean to be intrusive or stalker like but I am glad to see you looking well and happy and doing “awfully big adventures” . Thanks for thinking of me. I’m great! We’ve been working a lot on our new project, so we haven’t had many adventures to share. It’s not so exciting to hear about me sitting at my desk writing 🙂 But I’m super healthy and happy.